I have a deep, dark secret. For the longest time, we didn’t do any meal planning. At first, I made a weekly menu and would decide which individual meal from the list I wanted to make that day. But then I got lazy. I didn’t make any menu at all. Instead, I would simply make a list of random foods that I liked having around, such as chicken breasts, broccoli, and Hamburger Helper. Each day, I would rifle through the pantry and refrigerator and decide what I was going to make. Food waste was more prevalent than I care to admit, the quality of meals was decreasing, and our grocery bill, and weight, was on an upward trend. Finally, we got serious about it. My wife printed out several sheets of calendar pages and we started meal planning. Sales circulars are consulted to see what is on sale. Low-fat and low-carb meals come the day before I donate plasma. Foods I can easily prepare ahead of time for my wife to take to work with her are listed on the days she works second shift. At least one completely new meal is prepared each week so I have something to write about. We are now eating healthier than we have been in a couple years and have something that works with our schedules. But what surprised me was the savings. After a month’s worth of shopping, our grand total spent on food was $183.47. Lately, we had been averaging close to $300 per month on groceries. Depending on what part of the country you are, $300 may seem like a pretty good deal. Compared to what my mother pays in NJ, for just herself, it is a phenomenal price. But for the area and for what we were eating, there was definite room for improvement. Take stock of the available sales and coupons, the recipes that you already know how to cook and your family will eat, and any potential scheduling problems for the week. Decide on an entrée and any sides for dinners. I try to make sure I have a complex carbohydrate with each meal. Include lunch and breakfast ideas. Breakfast at my house is usually cereal or oatmeal, but once per week we have eggs or pancakes. Lunch is normally leftovers or a sandwich. I don’t think breakfasts and lunches need to be set in stone, but it is good to be prepared for them. In a notebook or on the computer make a list of every single ingredient needed to make each dish. I start with the entrée and then side dishes in the left column and in the right column list each ingredient. Include spices you plan on using; spices are my biggest problem to remember to stock up on normally. Done right, your list should be a couple pages. My last list was three college-rule notebook pages long. Next, go through refrigerator, freezer, and pantry. If you have enough of an item for that meal, put a check next to it. Go through the entire list. Only check it off if there is enough for that meal. If you have enough rice for stuffed peppers on Wednesday but then won’t have enough for stir-fry on Saturday, check it off where it appears for stuffed peppers but not where it appears for stir-fry. On a new sheet, copy each ingredient that doesn’t have a check. On this new list, make a tick mark for additional time it comes up. In a two week menu, it isn’t uncommon for us to have chicken 5 times. Good thing I buy those economy packs. The next couple parts can probably be done in any order. Get out your coupons for everything on your list. Mark off somehow that you have a coupon. Next, go online. I usually start with scanning the big coupon sites like Coupons.com and RedPlum (now Save.com) to see if they have anything I need. Then, I google. I simply type “ingredient name” coupon and see what I can find. I also started to use Ibotta as well. 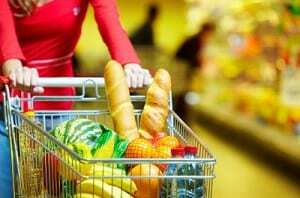 I do believe that some of the biggest grocery savings come from knowing which store to shop at for each item. So next, I sort my shopping list by the store that has the best price for the item, either because they are cheaper in general, they are having a sale, or there is a store-specific coupon. Finally, I sort each list by the arrangement of the store. Once you are comfortable with a store’s layout, you can know exactly which isles you need to visit and which you can skip. Skipping unneeded isles is a great way to avoid impulse buys. By following this guide, we shaved 40% off of our grocery bill. If your shopping is even less disciplined than ours was, your savings could be even greater. Do you do any meal planning? What do you do to save money on food? My wife and I decide on meals based on the sales flyer we get in the mail. I also pick up meat at the grocery store that is close to the expiration date. Most times, there is a $1 or $2 off coupon attached to it.